YOUNGSTOWN, Ohio – One of the oldest buildings in Youngstown is enjoying new life as a downtown event space. Concept Studio, co-owned by Mary Ann Meyer and her daughter, Christina Porter, opened this week in the ground-floor space of the John R. Davis Building, 217 W. Federal St. The space has been occupied by a couple of businesses since Sweet Jenny Land Co. purchased and renovated it about 10 years ago. Most recently, Spruce Home Décor & Gift Store used it for a holiday season pop-up store. Concept Studio has a three-year lease for the space, with an option to renew, Meyer said. She was looking for something different to do since semi-retiring from an auto disassembly business she operated in Cleveland. Porter went to school for culinary management and has a background in catering and event booking. The mother-and-daughter entrepreneurs were inspired by the venue for an event they had attended in Pittsburgh, said Meyer, who is president of the company. The two sat down with representatives of Score Youngstown for counseling prior to launching the business. Clients can some in and decorate the space as they want and bring their own tables, chairs and audio-visual equipment, or work with Concept Studio to plan the event. “We were looking for something different,” Meyer said about the space. Both also liked this historic nature of the building, which was constructed in 1899, according to Mahoning County records. The building is the second oldest on West Federal Street, according to architect Ron Faniro, one of Sweet Jenny Land Co.’s three owners. The 2,100-square-foot space has 1,800 square feet available for events, plus office space and a food preparation space with a refrigerator, sink, ice machine and work tables. The event center fills a need for such space downtown, Faniro said. The architect belongs to several community organizations, each of which has groups and boards that need small- and medium-sized meeting space for events and general gatherings. “There are spaces in downtown that are either too large or too small,” he said. This week, Concept Studio is hosting a spring pop-up market through Saturday to introduce the new event space to the public. The featured vendors are Charm House Décor, Salem; Blush Boutique, Branch Street Coffee Roaster, both from Boardman; and Kabocha Concepts, which operates at several pop-up locations. 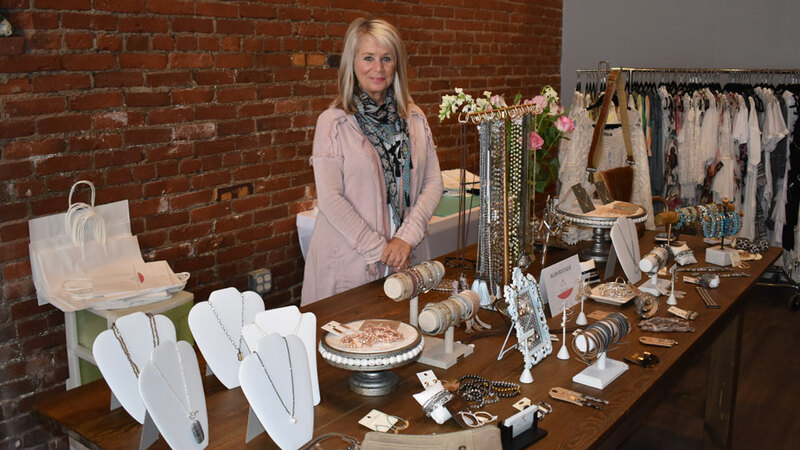 Susi Schultz, owner of Blush Boutique, said she participated in the downtown pop-up to support Meyer and Porter in the new venture, as well as to “bring a little bit of Boardman” downtown and call attention to her store, which is celebrating its fifth anniversary this year. Blush Boutique owner Susi Schultz is using the pop-up shops at Concept Studio to call attention to her Boardman store, celebrating its fifth anniversary. “Response has been great,” Schwartz said. The warmer weather this week has helped foot traffic and to draw people in to expose them to the new space and how it will be used. Kabocha, which is based in Youngtown, changes its menu at every pop-up, said owner Abraham Covarrubias. This week, he is featuring Asian foods, including chin chin noodles and miso ramen. “Business has been increasing steadily since Day One,” he said. Bookings for upcoming events include wedding showers, conferences and seminars, and photographers have also shown interest in using the space for photo shoots, Meyer said. “The majority of the people who come in are really excited that there’s something downtown and they are looking for somewhere that they can have events down here, smaller or more intimate events or meetings,” Porter added. People also like the “open concept” of the space where they can bring their ideas for their events, she added. Pictured: Concept Studio co-owners Mary Ann Meyer and Christina Porter have turned the first floor of the John R. Davis Building into a multi-use event space.